Complete your dining table with the Liberty Furniture Carolina Upholstered Side Chair. 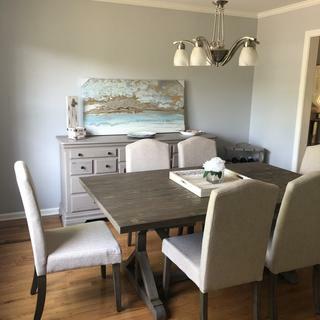 This dining chair is upholstered in light tan fabric combined with tapered legs in a wire-brushed weathered gray finish for a modern rustic look. Nice chairs. Good color and fabric. Not the most comfortable. Clean cut and don’t take away from other things in the room! I was reluctant to buy chairs because I really wanted studding on them. But my mom convinced me they would be too much. I’m so delighted with these chairs. They are classic and will never go out of style. And so comfortable!